Friday May 5 1911 Mr [Dewey?] came today and papered the room before 5 oclock. I did some work in the garret and the garden. Mother is complaining more with her toe today. Not quite so well. Saturday May 6 1911 Will and I went to town in the buggy. Took down a lot of old carpet and a lot of other things. Will went to town again in afternoon and I finished fixing the strawberry bed washed some dresses. William 13 years old. Sunday May 7 1911 Will 65 years old today. We were busy about the work most of the forenoon. Rob & Cora were out on horse-back. Elmer Anderson and family in afternoon. I went down home to stay all night. 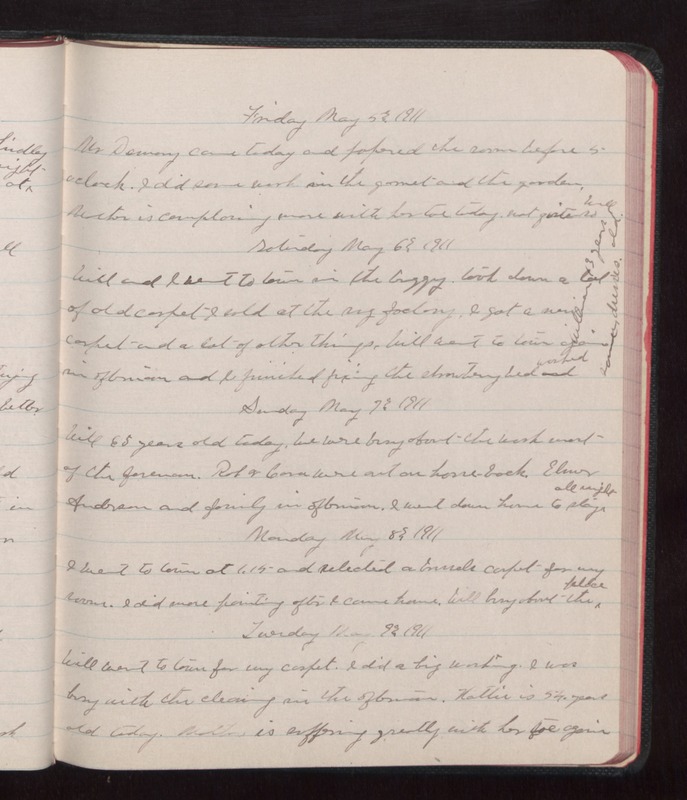 Monday May 8 1911 I went to town at 1.15 and selected a [illegible] carpet for my room. I did more paining after I came home. Will busy about the place. Tuesday May 9 1911 Will went to town for my carpet. I did a big washing. I was busy with the cleaning in the afternoon. Hattie is 54 years old today. Mother is suffering greatly with the toe again.